Sale 30% off many items, ending soon! 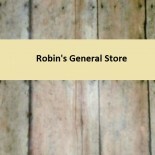 Robin’s General Store sale Sale 30% off many items in our store through Sunday October 24! We have dinnerware, sewing patterns, books, and other items on sale now.